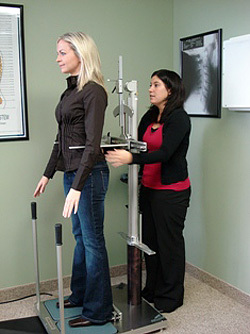 When you visit Precise Chiropractic you will be greeted and asked to fill out some detailed information about yourself. Then one of our doctors will go through a detailed history with you and determine what’s going on with you and if you are a candidate for care. From there the doctor will explain the NUCCA procedure and answer any questions you may have. Then a leg length evaluation is performed to determine the length of the legs. 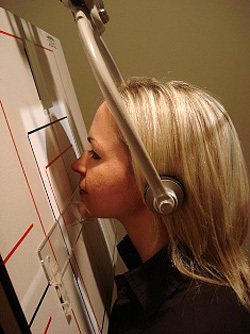 A computerized nerve evaluation is done to determined how the nerves are functioning that come out of the neck and low back. There are three x-ray pictures taken. One x-ray from the side, one from the front, and one from the top. The three highly specific x-rays are taken to determine how the spine is misaligned. The pictures give a three dimensional view of the spinal misalignment. The spine can misalign one of 10,000 ways and its only misaligned one of those ways. Everyone has their unique spinal misalignment, it’s like a finger print. Once the x-rays are taken the next step is to analyze the x-rays. The NUCCA procedure uses very specific instruments to read the x-rays and determine your spinal misalignment. Once your spinal misalignment is determined, the doctor will explain your x-rays in detail and show you how it may be corrected. That would conclude a first visit to the office. Then the doctor will take all the information collected and put it all together to determine your spinal misalignment. 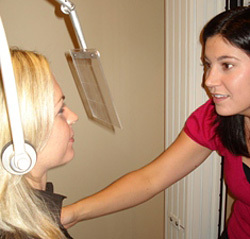 After your spinal misalgnment is determined, the doctor explains all the findings from the first visit, answers any questions you may have and then you would receive your first adjustment in the office. After the adjustment, two post x-rays are taken to verify that the misalignment was reduced and went in the right direction. There are no more x-rays taken after that unless you had a new major trauma and there was a need for a new x-ray.